Description of "Financial Literacy: The Basic Requirement for Financial Freedom (eBook)"
Jacob Basi Malatji (JB) is a married father of two. Basi is passionate about people development and their advancement in life. He is also fascinated by the potent power of the human spirit to overcome challenges, to dream and make their dream come true regardless of the obstacles and difficulties with which they meet in life. JB Malatji is a firm believer in quality education that empowers people to think independently and critically about anything idea they wish to pursue. JB Malatji is a former banker. He held several managerial positions with different major South African banks and during that time he engaged both individuals and business customers in money matters enabling them to build solid financial foundations. JB Malatji is an MBA graduate, an entrepreneur, an author of three books, and an entrepreneurial and junior management development consultant. He is currently working on a junior management/supervisory development model which he believes will benefit junior managers/supervisors, entrepreneurs and small business owners. Basi emphasizes to all his customers the importance of personal financial development through the acquisition of financial skills as the key for success in their pursuit of financial freedom. In this way he believes that poverty and lack are not an option. 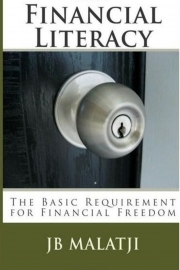 Reviews of "Financial Literacy: The Basic Requirement for Financial Freedom (eBook)"